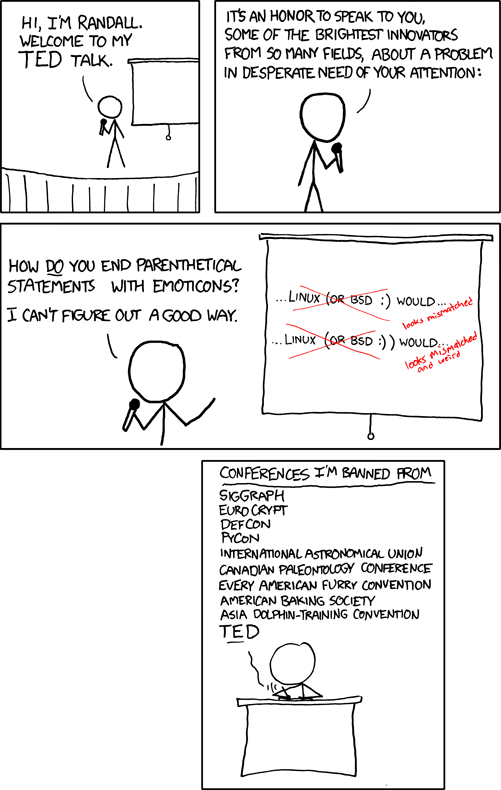 “The PyCon organizers committee would like to confirm that Randall Munroe of xkcd is, in fact, banned from PyCon 2009. We apologize to all 2008 attendees for last year’s disgraceful keynote, “Web Spiders vs. Red Spiders”. PyCon is a serious conference and we will not countenance this sort of nonsensical frivolity. Many of our sponsors feel that Mr. Munroe is the single largest cause of programmer distraction and his presence would be inappropriate. Es gibt keine Hinweise darauf, dass Randall Munroe tatsächlich einen Vortrag auf der PyCon 2008 gehalten hat. Vielmehr sieht das ganze nach einem Witz der PyCon-Leute aus — einem sehr hübschen allerdings.